The Next Africa, an Axiom Best Business Book Award winner, will change the way people think about the continent. The old narrative of an Africa disconnected from the global economy, depicted by conflict or corruption, and heavily dependent on outside donors is fading. A wave of transformation driven by business, modernization, and a new cadre of remarkably talented Africans is thrusting the continent from the world's margins to the global mainstream. In the coming decades the magnitude of Africa's markets and rising influence of its people will intersect with other key trends to shape a new era, one in which Africa's progress finally overshadows its challenges, transforming an emerging continent into a global powerhouse. The Next Africa captures this story. Authors Jake Bright and Aubrey Hruby pair their collective decades of Africa experience with several years of direct research and interviews. Packed with profiles; personal stories, research and analysis, The Next Africa is a paradigm-shifting guide to the events, trends, and people reshaping Africa's relationship to the world. Bright and Hruby detail the cross-cutting trends prompting Silicon Valley venture capital funds and firms like GE, IBM, and Proctor & Gamble to make major investments in African economies, while describing how Africans are stimulating Milan runways, Hollywood studios, and London pop charts. The Next Africa introduces readers to the continent's burgeoning technology movement, rising entrepreneurs, groundbreaking philanthropists, and cultural innovators making an impact in music, fashion, and film. 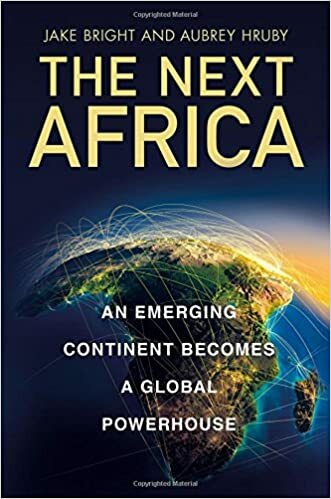 Bright and Hruby also connect Africa's transformation to its contemporary immigrant diaspora, illustrating how this increasingly affluent group will serve as the thread that pulls the continent's success together. Finally, The Next Africa suggests a fresh framework for global citizens, public policy-makers, and CEOs to approach Africa. It will no longer be "The Hopeless Continent", nor will it become an overnight utopia. Bright and Hruby offer a more nuanced, net-sum, and data-rich approach to analyzing an increasingly complex continent, reconciling its continued challenges with rapid progress. The Next Africa describes a future of a more globally-connected Africa where its leaders and citizens wield significant economic, cultural, and political power--a future in which Americans will be more likely to own African stocks, work for companies doing business in Africa, buy African hits from iTunes, see Nigerian actors win Oscars, and learn new African names connected to tech moguls and billionaires.